Coming to Rome in June? It is still mostly a spring month so the weather is gorgeous! Warm but not too hot, with long sunny days and little rain. June is a great time to be in Rome! 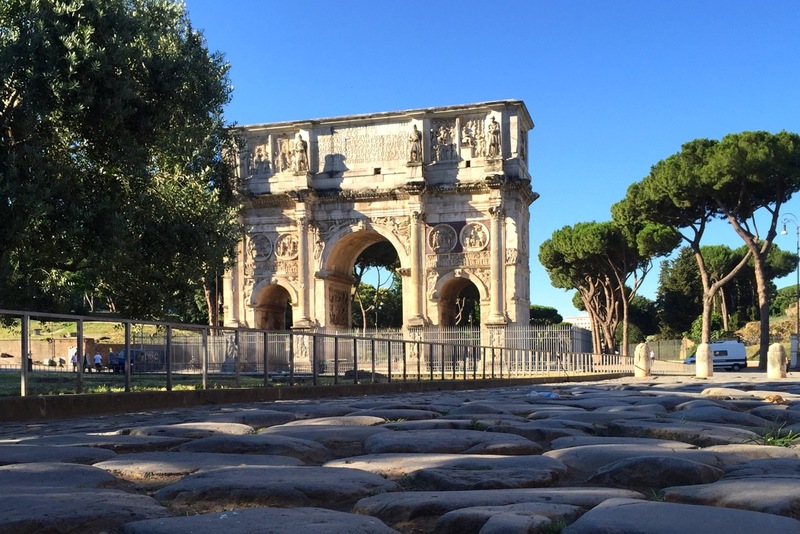 The Arch of Constantine on a sunny spring morning in June in Rome. What to pack? What to wear in June in Rome? Is June a good time to visit Rome? What food is in season in June in Rome? What's happening in June in Rome? What are some things to do in June in Rome? At the beginning of June, we are still in spring-mode: the days are warm, and Rome is full of flowers. But we can have some temperature swings, and rainy days, and cool evenings. By the end of June, summer weather is here and you can count on long, warm sunny days and comfortable evenings with only a touch of breeze. During the day it's in the high 20's C / high (low 80's F), and in the evenings, it's in the high teens C / high 60's F.
If you follow me on Instagram, you know I walk all over Rome. I just love it, any time of year. I always find something new to see, and I enjoy soaking up the atmosphere as I go. So trust me when I tell you that I know what to wear when walking around Rome, year-round. Below you see photos of products I've researched and in some cases, own. If you click the picture, it will take you to Amazon.com, and if you purchase anything there, I will earn a small commission. Please rest assured, the prices are the same whether you click from here or buy directly. I invite you to visit my page about Affiliate and Advertising Disclosure. With the warm weather, a lot of people want to walk around Rome in shorts. While Romans won't dress this way, you can if you want to. But if you are visiting any church (that includes the Vatican and Vatican Museums), or other Christian site, you cannot have bare knees. These hiking pants with removable leg are perfect for a quick change. Here is the men's version of the same type of hiking pant with leg bottoms you can un-zip easily. I say this on every page about what to wear in Rome, but it's because in Rome, you can never go wrong carrying a scarf with you. Even in warm spring/summer months. A light cotton scarf can warm you up on a chilly evening, or if you need to cover bare shoulders to go into a church. A maxi skirt is another good way to be cool and comfortable while sight-seeing, but also appropriate for visiting any Christian sites like churches and catacombs. T-shirts are perfect for Rome in June, since they are short-sleeved for warm weather, but still covering your shoulders. A light cardigan is a good idea for travel to Rome in June, and is easily packed in your luggage (or good to wear on the chilly airplane) but also your bag or backpack while you walk around Rome. Here is a light men's cardigan, which is versatile and perfect for the plane or a cool evening. For more on what to pack for Rome, with downloadable packing list, visit my page all about this. This photo near the Pantheon in Rome in June shows how people are dressed. The weather is warm and you see everything from tank tops to tees, to shorts to longer cotton pants. Don't forget your sunglasses and sunscreen! Extremely comfortable shoes/sturdy walking sandals. I cannot stress this enough! In June in Rome, the evenings are pleasant and it's nice to eat outside. Since June is still mostly a spring month, you should expect the possibility of a cool evening, and have a cardigan and/or scarf with you just in case. June, especially late June, is shorts and tank-top weather, but you won't find (most) Romans dressing like this in the city (although they do at the beach.) You may find some Roman teenagers wearing short shorts, but otherwise most Romans don't. But they are used to tourists doing it, so if you want to, go right ahead. June is one of those months when everyone wants to come to Rome. A lot of people are out of school, and it's high travel season all around Europe. June days are long and sunny and pleasant, and not too hot, so it's very appealing to be in Rome now. And, you can combine your visit to Rome with a visit to the seaside, which makes flying into Rome even more attractive. Is it crowded in Rome in June? So yes, June in Rome is very crowded. Plan for high airfares and hotel rates, and plan for crowds. But plan ahead and book what you can in advance to avoid long lines. And try to get off the beaten path to avoid the crowds if you can. The markets are full of fruits and vegetables and bursting with color. In June, you can still get some spring fruits and veggies like beans, asparagus and strawberries. And you start seeing some of the fruits that will be more abundant in summer, like peaches and figs. But June is definitely a time to start indulging in tomatoes, apricots, and cherries. In June, winter veggies are as far from being in their season as possible, so this is NOT the time to look for artichokes, broccoli and puntarelle in Rome. You need Roman artichokes for the braised kind and they are not in season! Sorry! 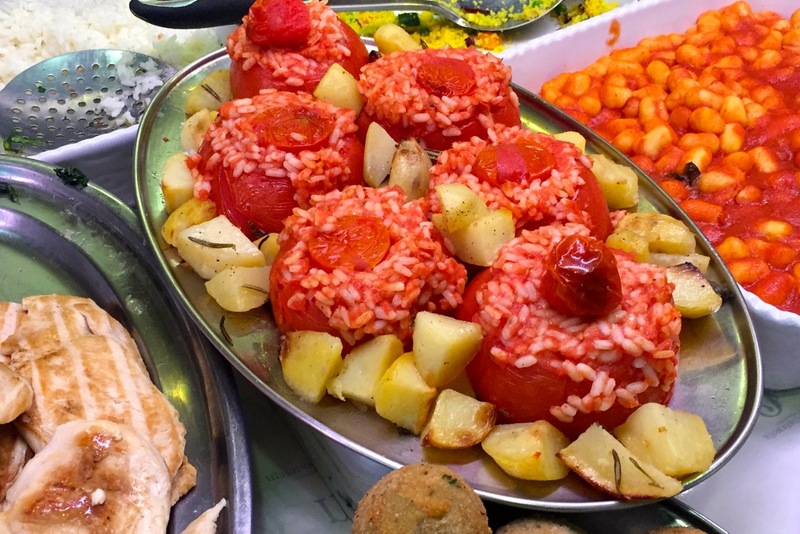 Around this time of year, I start seeing one of my favorite summer peasanty Rome dishes, pomodoro al riso, which is just tomatoes stuffed with white rice, and cooked with potatoes. It is just oh so homey and oh so yummy. Bring on the starch! June in Rome is a fantastic month for taking a food tour. It's warm but not too hot to walk around, and you will get to taste and learn about a lot of these seasonal specialties. 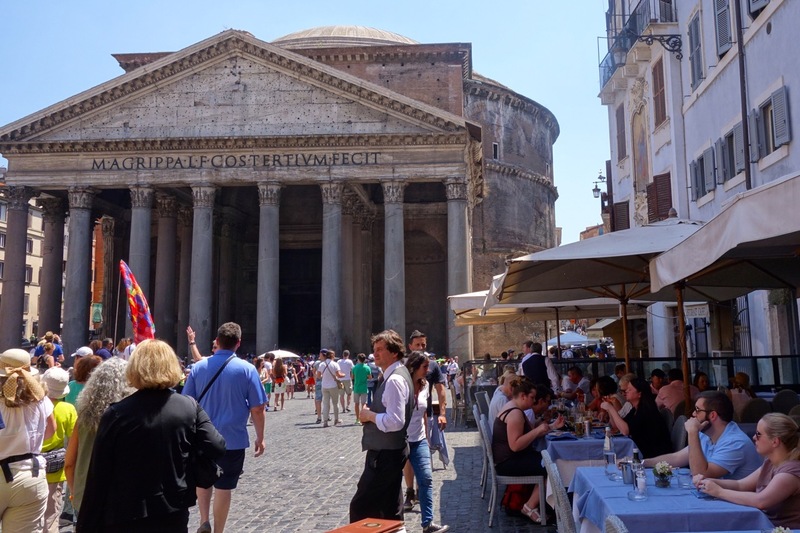 Sign up now for a Rome Food Tour! 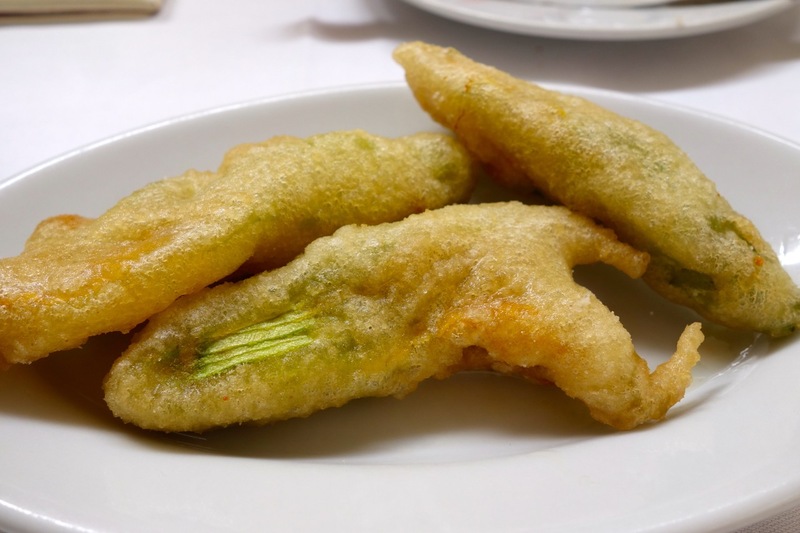 Another summer favorite are zucchini flowers, fiori di zucca. These are something you now find all year in Rome, but they are at their best in summer. And my favorite way to have them is Roman-style: stuffed with mozzarella and a little anchovy, lightly battered and fried. The dough should not light and crispy, and the mozzarella should stretch out and not be overly wet or crumbly. They are perfect as a pre-pizza appetizer, but you can find them at many Roman restaurants. My husband Alessandro (who is Roman and a fritto afficionado), and I do a lot of zucchini-flower taste-testing around Rome. Ahem. Our favorite places to eat these are Roberto e Loretta (the best), Pizzeria Emma, Sforno, Piccolo Arancio and Pizzeria San Marco. 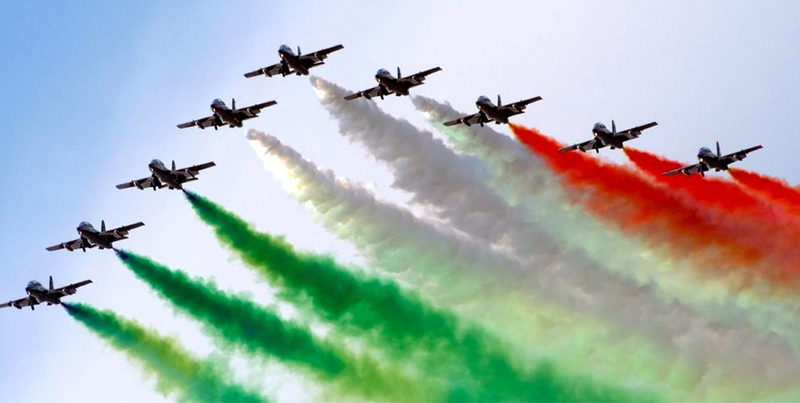 The Festa della Repubblica celebrates the day the monarchy was abolished, and Italy became a republic, on June 2, 1946. Every year on June 2, we celebrate the anniversary of this important date in recent Italian history. Expect parades along the via dei Fori Imperiali. There will be street closings and other events around the Complesso Vittoriano and Fori Imperiali. Another June holiday in Rome is San Pietro e Paolo, or Saints Peter and Paul, celebrated on June 29. Peter and Paul are the saints of the city of Rome. So this holiday is celebrated only here in Rome. Some things will be closed, and you may expect celebrations at some churches in Rome, in particular, St. Peter's Basilica (the Vatican). A lot of things are going on in June in Rome. Until 2018, we had the "Free Sunday", in which state-run museums were free for everyone on the first Sunday of the month. This is no longer the case, exactly. Now, there is a "Culture Week", which took place March 5-10, 2019. From April - September inclusive, there will NOT be a Free Sunday. They resume on the first Sunday of October, which in 2019 is October 6. The first Sunday of every month, state museums and archeological sites USED TO BE free (see above). 5 June 2019 - World Environment Day, established by the United Nations. On those dates the Colosseum/Forum/Palatine are free but will be packed. I'd recommend visiting some lesser-visited sites, like the Ostia Antica or Palazzo Barberini. For a complete list of free sites/monuments, visit the Rome Tourist Board. From early June through early September, enjoy the annual outdoor festival, Roma Estate Lungotevere, along the banks of the Tiber River. 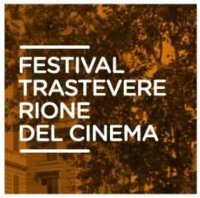 From June 1 - August 1, enjoy free movies under the stars, in the lovely Piazza San Cosimato in Trastevere. Put on by I ragazzi del Cinema America, you can see a movie every night starting at 9:15pm. Movies range from Disney/Pixar, to Italian Comedy, to Scorsese to documentaries. Most are in Italian with English subtitles. The link at left is in Italian only but will show you the entire program. 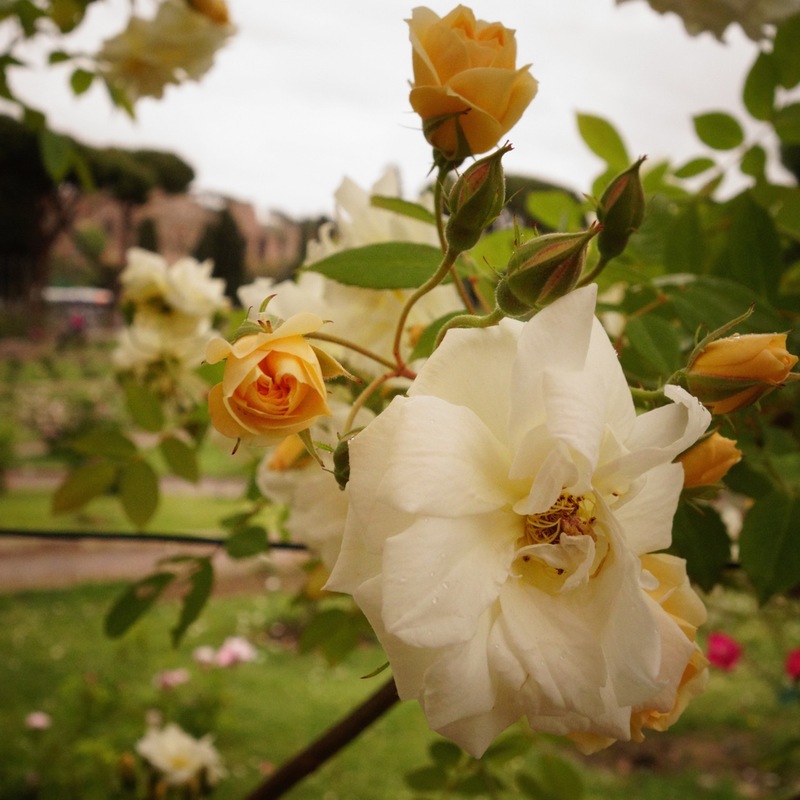 Rome's Roseto Rose Garden is open only during spring, and it's a very special place to visit: in part for the beautiful roses, in part for the backdrop of the Palatine Hill, and in part for its history: it was once Rome's Jewish cemetery, and if you stand at the top of the garden, you can see that the shape of the walkways is a candelabra. Open through June 19, 8:30 am - 7:30 pm. Free entry. On the last Sunday of the month, the Vatican Museums are open and free. Hours are 9am - 2pm, with last entry at 12:30. No reservations are possible and tours don't generally go this day. If you don't show up long before 9am, you risk waiting more than an hour, even two, in line, and not getting in. If you are on a tight schedule and this is the only day you can go, or a tight budget, then this is a great opportunity. But otherwise it is usually better to book your visit ahead of time and pay to go another day. Some of the free things above are also night-time things to do. 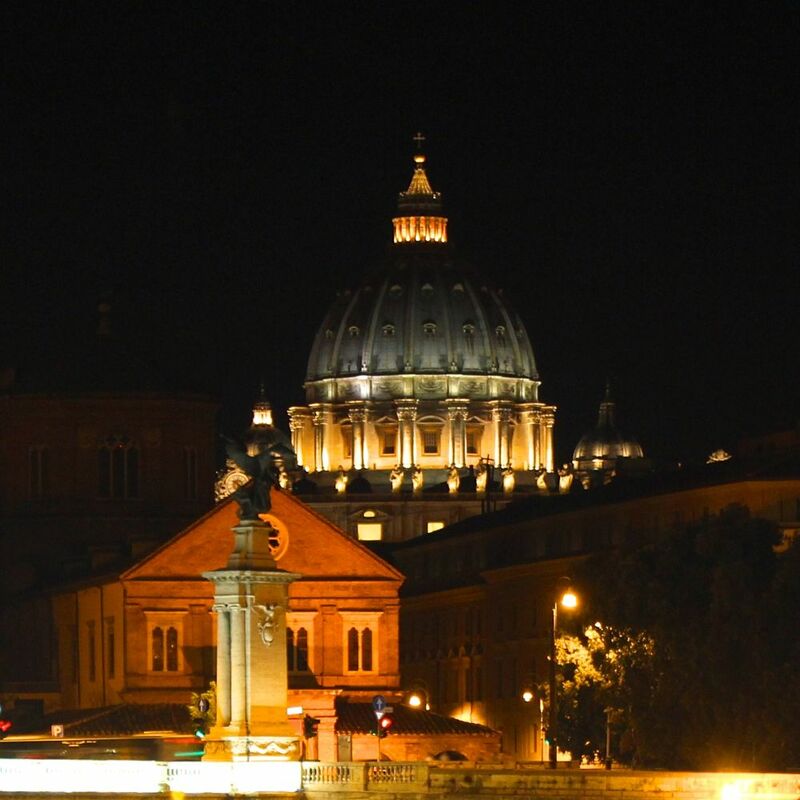 Here are some more night-time things to do in Rome in June, and they are all wonderful! Now through fall, you can visit the Colosseum at night! This is a very special thing to do as you see the colosseum from a very different point of view. Open Thursday, Friday, Saturday and Monday nights from 8pm to midnight. 20€ and not to be combined with the Roman Forum. Not part of Roma Pass. Click the photo to go to the official website and online ticket office, or, if you'd like a more complete night tour, click here. NB - They don't usually open this on Coopculture until right before the event so if you don't see availability for when you want to go, check back. One of the best night shows in Rome, I highly recommend this wonderful laser/hologram/light show in the Forum of Augustus (along the Via dei Fori Imperiali, leading to the Colosseum), that brings the whole place to life. Combine it with the light show of Julius Caesar's Forum and you will really have a sense of Ancient Rome. Amazing and special thing to do in Rome! Various 40-minute shows from about 8pm. 15€ for one show, or 25€ for combined ticket of both shows. Click the photo to go to the official website of "Viaggio Nei Fori." Advance booking is strongly suggested. 7-11pm Friday nights only, with last entry at 9:30pm. Click the photo to visit the Vatican website for more details and booking options. Or, to book a more complete guided tour, click here. 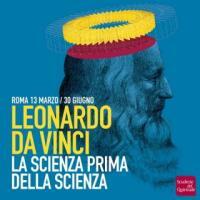 Leonardo da Vinci - The science before the science. March 13 - June 30, 2019. Scuderie del Quirinale, Via XXIV Maggio 16. Open: sun - Thu 10am - 8pm; Fri - Sat 10am – 10:30pm. Free for anyone under 18, and anyone disabled and their care-giver, with written medical proof. Click the photo to visit the official site. The Rome Chamber Music Festival 16th season. Held in the Salone Pietro da Cortona of the Palazzo Barberini, the acoustics and settings are a very special way to enjoy the music of this superb and talented group of musicians, led by Artistic Director and violinist Robert McDuffie. June 12-17 2019. Click the photo at left to go to the official webpage and for ticket info. From early June through mid September, everyone is welcome to Gay Village, one of Rome's largest LGBT festivals of the year, held in the huge Città dell'altra Economia in Testaccio. Open daily, there will be dance, music, nightclub and other live outdoor events. Sunday - Wednesday, from 6pm. Thursday - Saturday, from 7pm. Restaurants and cocktail bars are also on-site. Tickets required. Click the photo at left for events schedule, directions and tickets. 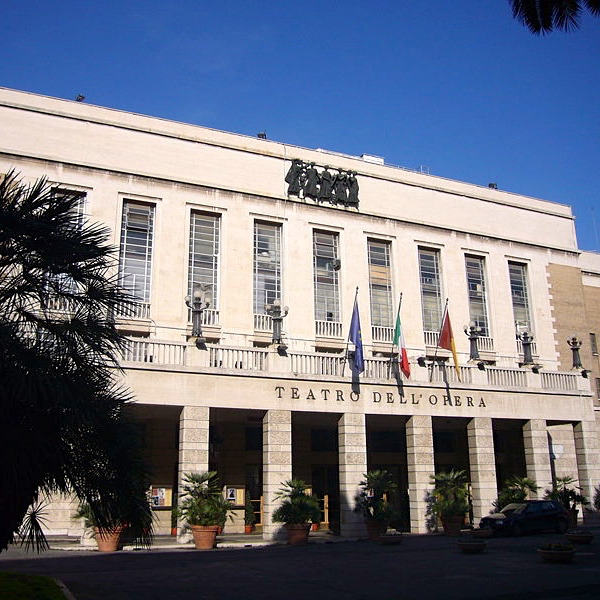 The Rome Opera House will show Sergej Prokofiev's The Fiery Angel only on June 1, 2019. Thereafter, you can see Gioachino Rossini's La Cenerentola from 08-13 June and, Giacomo Puccini's Tosca from 18-26 June, 2019. The Santa Cecilia hall, designed by renowned architect Renzo Piano, at the Rome Auditorium, is the perfect place to attend a concert. The complex is stunning, and for music lovers, the acoustics are just outstanding. Click here for a schedule of concerts, and to buy tickets. Enjoy listening to famous opera songs in the stunning and exclusive Palazzo Doria Pamphilj. The show includes drinks and dinner. See the "Three Tenors" in a beautiful church setting. You will be treated to three of Rome's most famous tenors singing some of the best-known and loved songs of Italian opera. 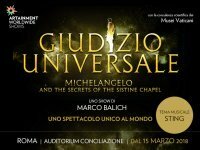 Enjoy a opera singing by Orchestra I Virtuosi dell’opera di Roma inside a scenic and suggestive setting in central Rome (locations vary). These wonderful opera singers put on a mini-production of various operas in full costume. 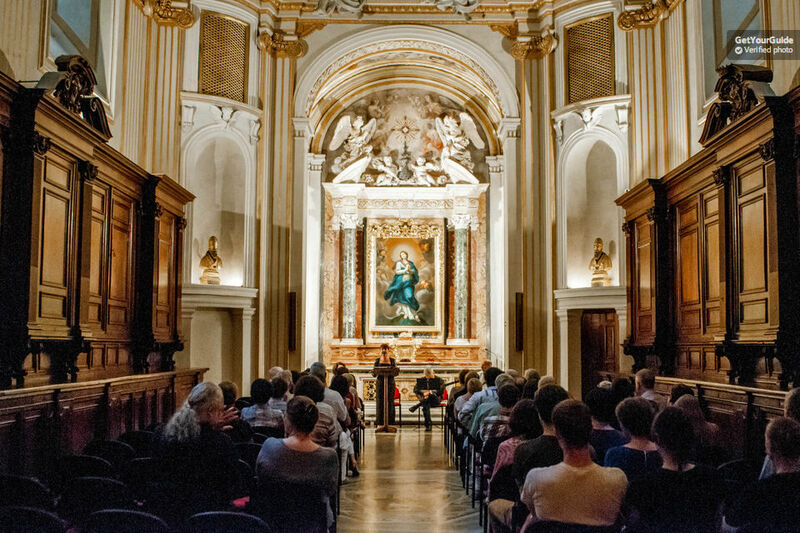 Listen to Baroque music in the perfect setting - the church of Sant'Agnese in Agone on Piazza Navona. You'll be treated to a tour of the church, and have the chance to listen to a wonderful Baroque concert in the sacristy, with superb acoustics. I've listed some of what I think are the most fascinating events in Rome in June, and most central. For a complete list of events in Rome in June, visit the website of the Rome Tourist Board. Maybe it's your 2nd (or 3rd or 4th) time in Rome. Or you have more than 3 days here. Or you just want to see and do lots of fun things. There are so many great options for taking cooking classes in Rome. From pizza-making to learning to make fresh pasta, to going shopping with the chef and making a home-cooked meal at his/her house. Click here to view cooking class options in US$, and here to view Rome cooking class options in other currencies. We are close to so many things, like Pompeii, Ostia Antica, Tivoli, Florence and much more. You can go out onto the Appia Antica, a lovely area to tour by bike. You can also try one of Rome's newest tours, by electric bike. What a great way to see the sites, get some exercise but not get too over-exerted. Click here to view Rome bike tours options in US$, and here to view Rome bike tours in other currencies. This is all the rage now. You want to learn to fresco? sketch? make mosaics? How about pottery? Want to include a little wine-sipping with your art? Rome inspires! Get creative! Click here to view Rome art activities in US$, and here to view Rome art activities in other currencies. We are already getting a lot of requests for pools in Rome. 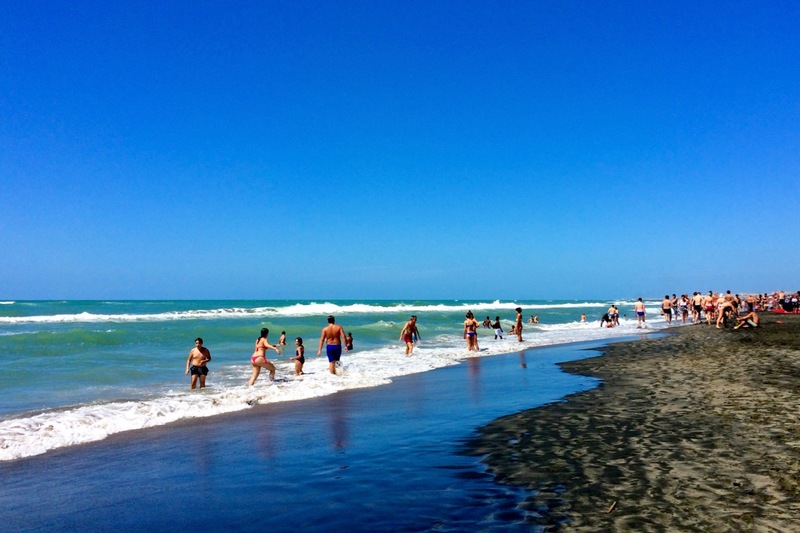 In fact, this is a great time to head to Ostia Beach, just outside of Rome. It's definitely warm enough, and won't be as crowded now since it's not fully summer yet. If you want a beach day, or to escape the crowds in Rome, grab your suit and hop on the train! This is what Ostia Beach looks like in June - peaceful and uncrowded. Fun in the sun! Want to share this page on Pinterest? Pin it here! 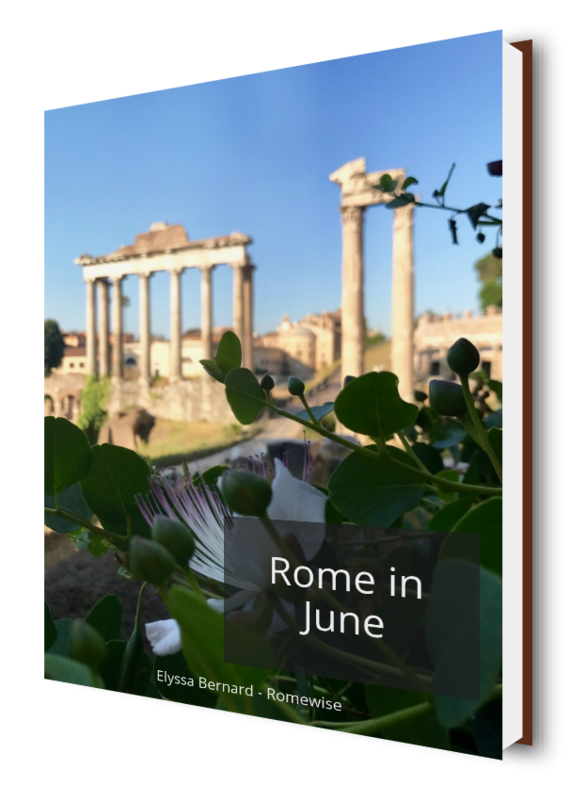 Get the Rome in June e-book today, and take it with you, even offline!